During the 2016 Fiesta season, the Fiesta Especial® Royal Court will represent Fiesta Especial® in the community demonstrating to others the abilities of all individuals to achieve their dreams...bringing visibility to the leadership and contributions individuals with disabilities make in our community each day. The Fiesta Especial® Royal Court program is a leadership and life skills development program for individuals with all types of cognitive, physical and sensory disabilities. baseball along with the millions of other children who participate in this sport worldwide. ​Vanessa is active in sports like bowling and track. She enjoys going to the movies, shopping, eating at fancy restuarants, dancing and listening to music. Adam has selected the Angels Challenger Team, New Braunfels Little League to benefit from his Fiesta Especial Royal Court campaign. The Challenger Division was established in 1989 as a separate division of Little League to enable boys and girls with physical and mental challenges, ages 4-18, or up to age 22 if still enrolled in high school, to enjoy the game of baseball along with the millions of other children who participate in this sport worldwide. 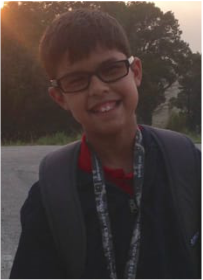 Calvin selected Job Adventures to benefit from his Fiesta Especial Royal Court campaign. Job Adventures is dedicated to helping students and young adults with special needs find meaningful and gainful employment. Calvin is very polite, helpful and caring. He will go above and beyond to help anyone. When asked why he wanted to participate in the Fiesta Especial Royal Court Program,he replied "getitng experiance and being a part of something that helps the community in a hugh way". 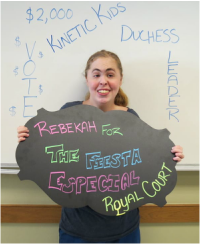 Rebekah has selected Kinetic Kids to benefit from her Fiesta Especial Royal Court campaign. Kinetic Kids provides unique experiences through physical and creative activities in a supportive environment to children with special needs who may otherwise be excluded. Rebekah is very caring and enjoys helping others. She's always looking for ways to make the world a better place. When asked why she wanted to join the Fiesta Especial Royal Court program. 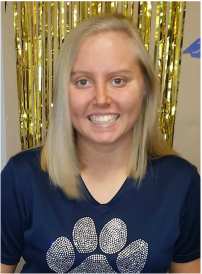 She relplied "I would like to learn more about how to give back to the community and I enjoy taking a leadership role to help people". Heather selected The Academy at Morgan's Wonderland to benefit from her Fiesta Especial Royal Court campaign. The Academy at Morgan's Wonderland provides an alternative to traditional special education programs and services. Heather had never let her challenges keep her from achieving her goals. She faces every challenge with a smile and is a cheerleader to everyone around her. Benefiting Charity: Kinetic Kids, Inc.
Rachel selected Kinetic Kids to benefit from her Fiesta Especial Royal Court campaign. Kinetic Kids provides unique experiences through physical and creative activities in a supportive environment to children with special needs who may otherwise be excluded. ​Rachel has an amazing disposition. She is always happy to help others. She enjoys being around people and socializing. She is beyond excited about representing the special needs community. Jeffery Krieger is our Honorary Court Member. He is a very outgoing gentleman and is an example of a determined mind. At just 14 years old he understands the importance of helping the community and everyone around him. He has a smile that can light up a room, and a heart of gold. He enjoys his extra-curricular activities which consist of Special Olympics Bowling, Track & Field, flag football, and basketball. December 6th, 2016: Fiesta Especial Royal Court Candidate Reception - Fajita Kick-off! will take place at Viola Ventana's from 4:30pm - 8:30pm. $25/person (children under 6 are free). Live music, food and fun for the whole family. February 17th, 2016: Fiesta Especial® Royal Court Coronation will take place at Texas A&M University-San Antonio from 6:30pm - 8:30pm. $15 Admission includes admission and reception. Click here for more details. April 2nd, 2016: Fiesta Especial® Royal Court Meet & Greet will take place at Mi Casa Tamales from 4pm - 7pm. Free and open to the public, this is a wonderful opportunity to meet the 2016 Royal Court. Activities for kids! Bake Sale! Fiesta Fun! Click here for more details. April 19th, 2016: Fiesta Especial® Celebration Day will take place in Alamo Dome Lot C from 10am - 3pm. Advanced Registrations Required. Free to individuals with disabilities and their companions. April 23rd, 2016: Fiesta Especial® Royalty Run 5K & Parade will take place starting at the City Hall in Windcrest at 8am & 10am respectively. Click here for 5K Registration or Parade Registration. The parade is free to spectators.